Samsung on Thursday announced it will bring its Samsung Pay mobile payments service to China through a partnership with e-commerce giant Alibaba's financial arm, an institution once rumored to be negotiating an identical deal for Apple Pay. As part of the deal, Samsung Pay will be integrated with Alibaba subsidiary Ant Financial Services Group's Alipay, service, which currently boasts more than 450 million registered users, reports Reuters. The system allows Samsung device owners to pay with provisioned cards or a registered Alipay account. The latter method should prove superior to Alipay's current implementation, which requires users to open a dedicated app before completing a transaction. For Samsung, the partnership represents a way into China's massive payments sector, an industry fueled by a rapidly growing consumer base. The Korean tech giant has seen its share of the Chinese smartphone market eroded by Apple on the top end and local upstarts on the bottom. Alibaba also benefits from the move. While the firm's Alipay network processes a majority of online payments, its mobile initiative has not enjoyed the same success. The company has been seeking out partnerships with major smartphone makers and was said to be in talks with Apple in 2014. Those negotiations apparently fell through. Interestingly, Alipay recently expanded cooperative efforts with ride hailing service Uber to let Chinese account holders pay for rides overseas. Weeks later, Apple announced a substantial $1 billion investment in Chinese Uber rival Didi Chuxing. 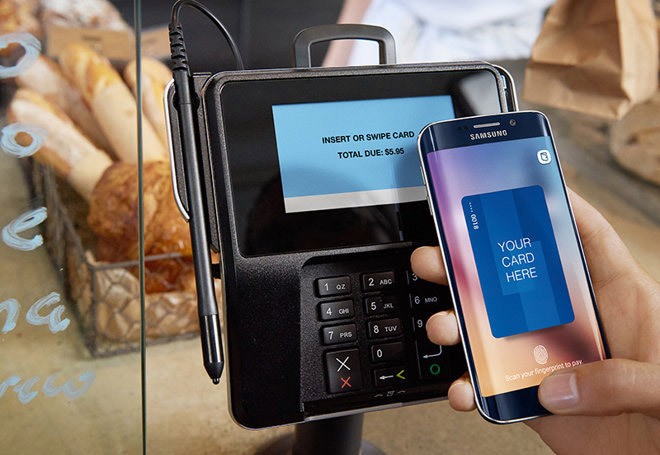 Samsung Pay launched in the U.S. last September. Like Apple Pay, Samsung's solution supports NFC communication, but adds on a separate wireless technology for reproducing card swipes. Both systems are protected by fingerprint authentication. Apple Pay made its way to China in February with initial support for 80 percent of all credit and debit cards issued in the country. Importantly, Apple was able to reach an agreement with state-owned China UnionPay, China's sole bank card agency and network.